Vitex is a small, deciduous tree or large shrub native to the Mediterranean and Central Asia. Vitex, also known as the Lilac Chaste Tree (Vitex agnus-castus), is a small, deciduous tree or large shrub native to the Mediterranean and Central Asia. It is an old-fashioned plant found in southern United States gardens and is perfect for modern landscapes that lack room for tall trees. 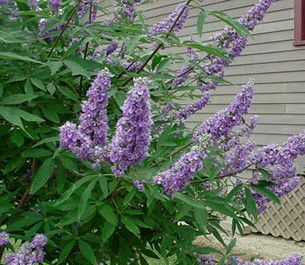 Vitex is most comfortable in Zones 6 through Zone 9 (South Texas) and will die in colder climates. It requires well-drained soils and will not tolerate standing water. Once established (about one a year), it is relatively drought tolerant, requiring regular water each week during the hottest months with much less water during the fall and winter. Vitex forms a small, multi-trunk tree of approximately 15- to 20-feet high. It requires full sun and if spent blooms are trimmed off, soon after flowering, it will re-bloom again before cool weather sets in. Leaves are aromatic. Butterflies and bees are attracted to the flowers, especially bumble bees. Flowers emerge from May to September. Vitex flower spikes come in shades of blue, like “Abbeville Blue” and “LeCompte,” which are featured here. Also, improved varieties like “Montrose Purple” and “Salinas Pink” have flower spikes that are 8- to 12-inches long. White flowering selections are also available. Older varieties will have lighter colored flowers and shorter flower spikes. If the color is not named on a plant tag, then purchase only during the blooming period to be sure that the color is what you want. Remove lower limbs and dead wood during the winter. Lantana and plumbago make excellent pairings with Vitex as either of them are drought tolerant, once established. Vitex is available at your local, licensed nurseries and is a good selection for butterfly gardens. Barbara Storz is a local horticulturist. You can listen to her gardening show at 7 a.m. Saturday on 710 KURV Radio. You can e-mail her at bstorz@rcommunications.com.